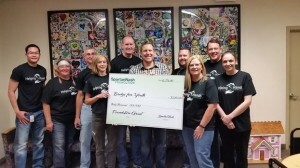 Edina, Minn. – As a part of SpartanNash’s fifth annual Helping Hands in the Community Day on June 29, more than 175 associates donated more than 1,000 volunteer hours at nine different non-profits in the Twin Cities area. The SpartanNash Foundation – the company’s charitable giving arm – also donated $120,000 yesterday to four of the organizations during the day of community service. Grants were presented to Casa de Esperanza, Loaves & Fishes, Sojourner Project and Bridge for Youth – all prior recipients of SpartanNash Foundation and NFC Foundation grants. The $30,000 donations will help the non-profit community partners end hunger, provide shelter and support our military heroes – the mission of the SpartanNash Foundation. 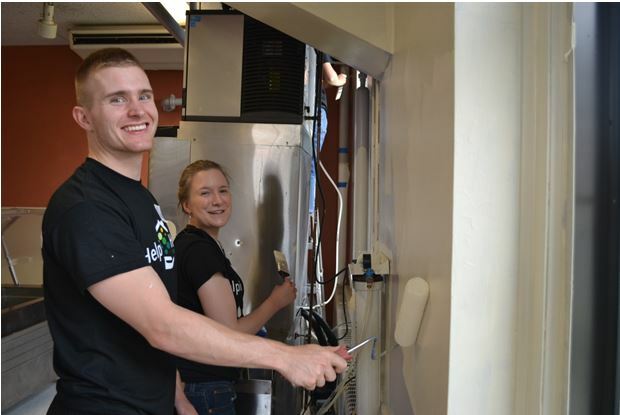 During the Helping Hands Day, volunteer groups from SpartanNash’s Edina, Minn. corporate office spent their day performing meal preparation, landscaping, deep cleaning, donation intake and sorting, interior and exterior painting and more. In addition to the four grant recipients, community partners for the Helping Hands in the Community Day included Catholic Charities, Fisher House, Habitat for Humanity, Neighbors Inc. and Perspectives. The inaugural Helping Hands in the Community Day took place when Nash Finch employees from the company’s Edina location spent a day volunteering together in June 2011. Since then, associates at the Minnesota corporate office have participated annually. To date, more than 2,000 SpartanNash associates in the Company’s three corporate office locations have helped contribute more than 10,000 volunteer hours to more than 40 different community partners during Helping Hands days in Minnesota and Michigan. CAPTION: The SpartanNash Foundation presented $120,000 in grants to Casa de Esperanza, Loaves & Fishes, Sojourner Project and Bridge for Youth as a part of the company’s fifth annual Helping Hands in the Community Day on June 29. CAPTION: More than 175 SpartanNash associates donated more than 1,000 volunteer hours at nine different non-profits in the Twin Cities area, including Catholic Charities’ St. Joseph’s Home for Children.